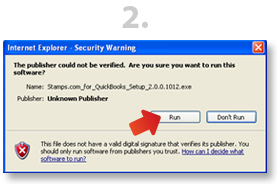 Stamps.com’s QuickBooks Plug-In gives you the capabilities of Stamps.com in your QuickBooks software – No need to re-enter your data! 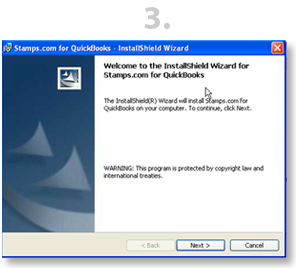 The Stamps.com QuickBooks Plug-In allows QuickBooks users to use the functions of Stamps.com within the QuickBooks interface. Print postage and addresses for your invoices, sales orders, or any other transactions from QuickBooks directly on envelopes or labels. Simply open the invoice (or other transaction) in QuickBooks and click on “Print Envelopes” or “Print Packages.” The Stamps.com window will open up with the address automatically imported from QuickBooks. You can select from different types of mail classes, compare rates, and choose the most cost-effective way to send your mail. You need to be a registered Stamps.com customer. To create a Stamps.com account, click here. The latest version of Stamps.com (download the latest version here). You must be using QuickBooks 2005 or later. You will need to be an Admin in QuickBooks or you will need the Admin to authorize the plug-in before you use it. Click on “Run” when you see this pop-up to begin downloading. 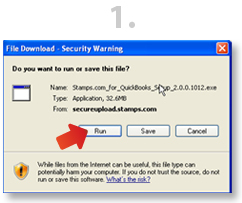 Click on “Run” again when prompted after the file has been downloaded. Follow the setup instructions shown in the setup wizard.